The stage is set, the orchestra is ready and the curtains open as a spotlight shines on some of America’s best and brightest teens who hope to make it on The Great White Way. This Thanksgiving, TLC cameras will follow deserving high school students who were chosen for a once-in-a-lifetime opportunity to attend an all-day symposium on careers in theater. Held at the White House, and alongside some of the biggest names on Broadway, 1600 Pennsylvania Avenue will transform into a space for students to explore their creative aspirations and dig into molding their emerging talent. 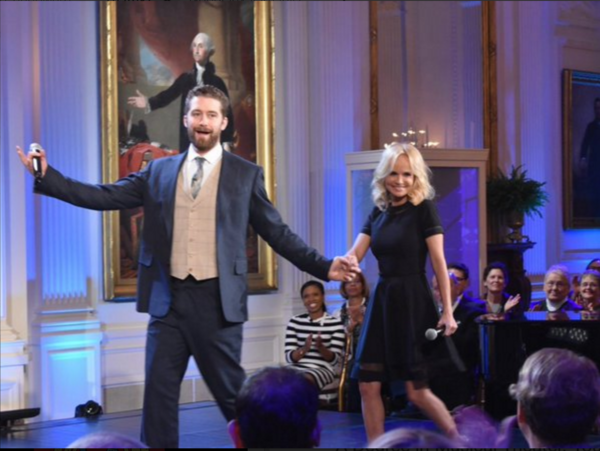 The special will be hosted by Kristin Chenoweth and Matthew Morrison with special guest, First Lady Michelle Obama. Also participating throughout the day will be Whoopi Goldberg, Gloria Estefan, Christian Borle, Cicely Tyson and other current Broadway performers. Throughout the day the special will follow approximately 40 students from both public arts high schools and after school arts programs, from around the country, as they attend master classes in their chosen field of study. Led by the professionals they hope to become, workshop subjects will include acting, directing, hair/make-up/costume design, music composition and musical theatre. In the afternoon, the students will attend a Q&A session, where a panel of Broadway professionals will offer advice, discuss their own careers and how they got started, and be available for questions. The day will culminate with an evening performance by the Broadway stars for participants and First Lady Michelle Obama. The performance will feature music from Finding Neverland, Fun Home, An American in Paris, On Your Feet!, School of Rock and Something Rotten. “We are excited to partner with the First Lady and Harvey Weinstein on Broadway at the White House to bring this compelling project to TLC viewers. Discovery’s strategy is to partner with world-class producers to deliver high-quality content across our platforms. We know that this program filled with educational and entertaining content will provide something for the whole family to enjoy at Thanksgiving,” said David Zaslav, President and CEO of Discovery Communications. “TLC is proud to partner with The White House and the First Lady to celebrate these remarkable high school students,” said Nancy Daniels, President and GM, TLC. “This is such an inspirational event that encourages Broadway hopefuls to develop their creative talents, and we’re thrilled to be the television partner that gets to share this amazing hour with families across the country on Thanksgiving.” Harvey Weinstein, Co-Chairman of the Weinstein Company commented: “I’m sure I speak for all the shows participating when I say how exciting it is bringing Broadway to the White House. And partnering with David Zaslav, the great team at TLC, and most importantly, the First Lady and her incredible work spotlighting the importance of arts education makes this event an even bigger privilege. It’s going to be such an incredible day for kids who love theater and the arts. My team and I couldn’t be prouder to volunteer our time and efforts for such a rewarding program. It truly shows us that nothing is beyond the reach of the community.” Broadway at the White House is produced by Zero Visibility, Inc./The Weinstein Company for TLC. The idea for the special originated from a similar event at the White House in 2013, spearheaded by The Weinstein Company and Academy-Award winning producer Bruce Cohen. The event centered around the film industry and brought some of Hollywood’s biggest names in for a day of film and cinema workshops with students. To join the conversation, use the hashtag #BroadwayAtTheWhiteHouse on Facebook, Instagram and Twitter. About TLC Offering remarkably relatable real-life stories without judgment, TLC shares everyday heart, humor, hope, and human connection with programming genres that include fascinating families, heartwarming transformations, and life’s milestone moments. In 2015, TLC was a top 10 cable network with women and over the past year had 25 series averaging 1 million P2+ viewers or more. TLC is a global brand available in more than 95 million homes in the US and 303 million households in 190 markets internationally. A destination online, TLC.com offers in-depth fan sites and exclusive original video content. Fans can also interact with TLC through social media on Facebook, Instagram, Pinterest and @TLC on Twitter as well as On Demand services, YouTube and mobile platforms. TLC is part of Discovery Communications (NASDAQ: DISCA, DISCB, DISCK), the world’s #1 pay-TV programmer reaching nearly 3 billion cumulative subscribers in 220 countries and territories.